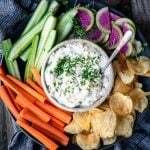 Keeping this post super short because it’s T-minus 30 hours until the Super Bowl kicks off, which means you need to get yourself to the grocery store ASAP and stock up on the essentials, including lots of onions so you can make this amazing vegan caramelized onion dip!! ANYWAYS, I’m getting off topic and I said I would keep this short. The key to the success of this dip is obviously the caramelized onions. 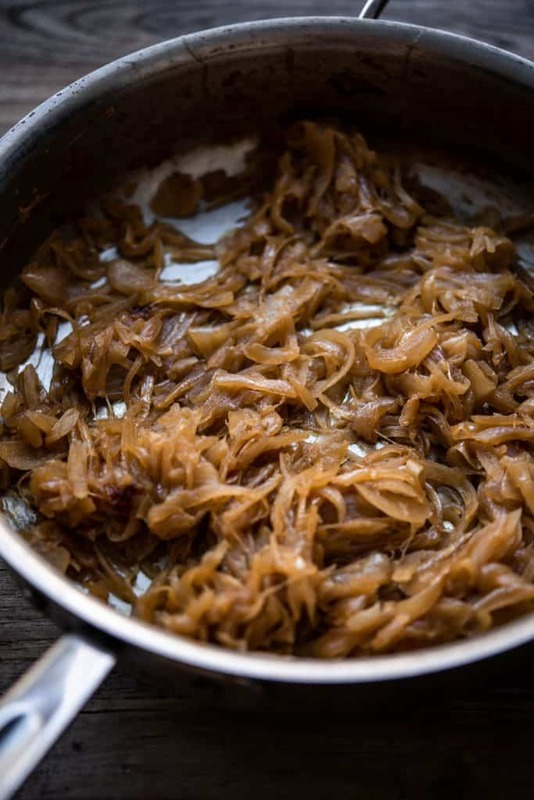 Making perfect caramelized onions is a labor of love. It’s well worth the 45 minutes in front of your stove. Be sure to keep a close eye on the onions so they don’t burn. Of course, you also don’t want to stir too frequently, otherwise, it will take ages. Low heat is key. For the first 15 minutes, it doesn’t look like much is happening, but don’t be tempted to crank it to high. I promise, they’ll be perfect if you follow the instructions! Now that we’ve covered the onions, let’s talk vegan alternatives to dairy. 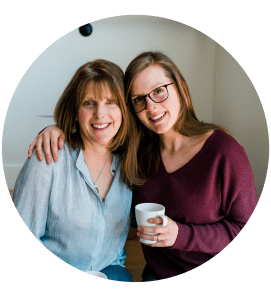 There are a ton of great options, but I’ll link to the ones we used here, because they turned out great. We use this vegan cream cheese (though we’ve also had success with Kite Hill products). We also just recently discovered this tofu-based sour cream. I know, it sounds bizarre, but it’s honestly delicious and really mimics traditional sour cream. Try a dollop on top of these hasselback potatoes – yum! 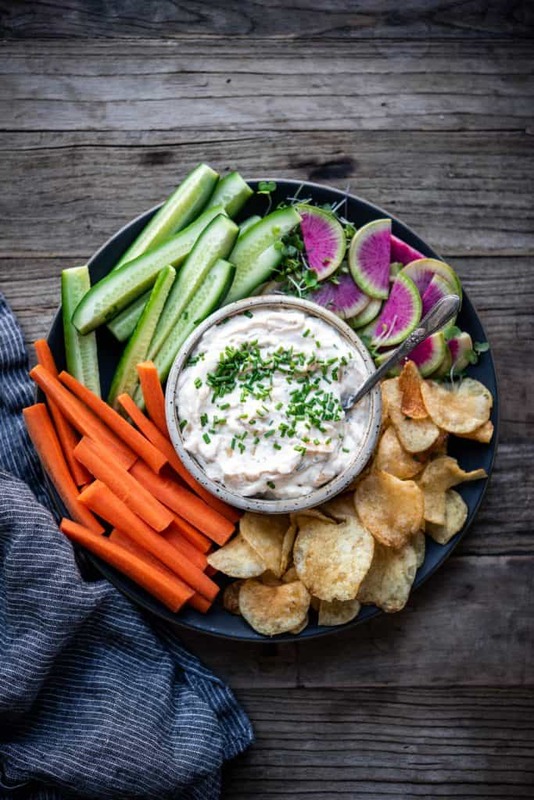 We suggest serving this with some traditional kettle chips (ugh, so good), but we also always throw some sliced veggies in there, because why not. Enjoy, and happy Super Bowl-ing(?)! 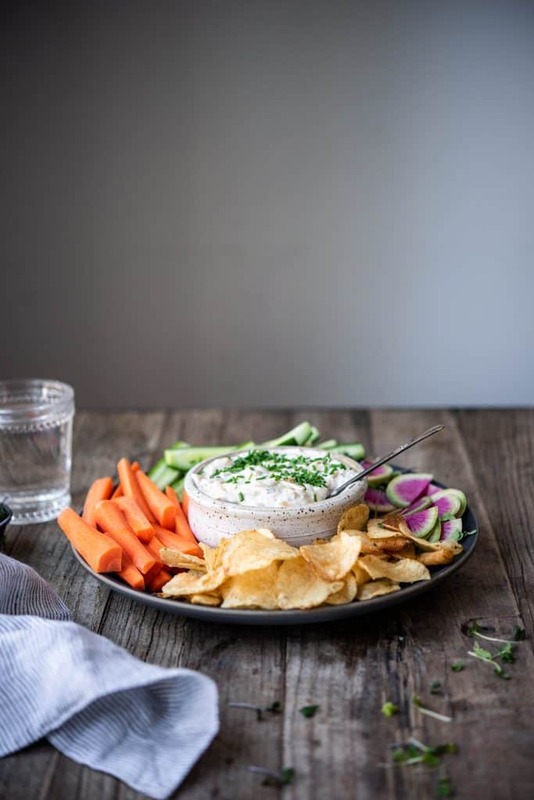 This creamy, savory vegan caramelized onion dip is the perfect Super Bowl appetizer! Heat a large pan to medium and add butter. 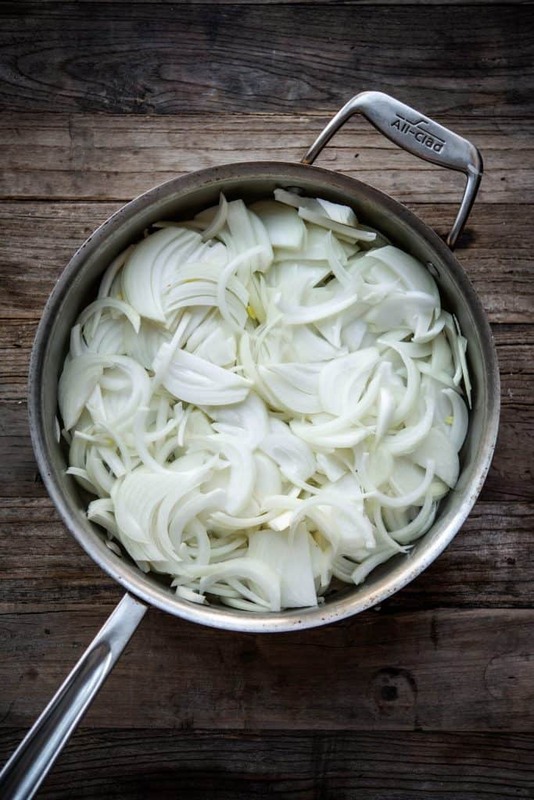 Once butter is melted, reduce heat to low and add onions and salt. Sauté for 10-15 minutes, stirring often. After about 15 minutes, add soy sauce and start adding wine, little by little, stirring often. Continue cooking for about 15 minutes, or until onions are deeply golden brown and caramelized. (See above photos for reference). In a large bowl, use a hand mixer to cream together vegan sour cream and cream cheese. Add caramelized onions and chopped chives and stir well. Serve with chips and sliced veggies. Enjoy! 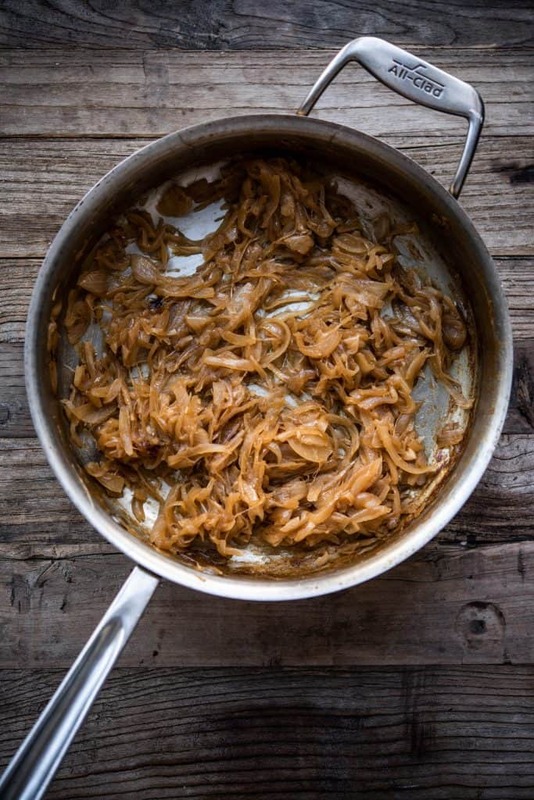 Tamari/soy sauce helps the caramelization process and adds extra umami flavor – it’s just not the same without it!